Little things that are sent to try us! Having completed my watch at midnight last night, I was enjoying resting in my bunk when I was awakened and brought into the cockpit at 0530 to admire how someone had managed to keep the boat sailing at a steady 5 knots despite the wind steadily dropping off. I won’t bore you with the details but you can do it at the expense of not maintaining the same direction. I tried to look impressed but suspect I didn’t do a great job of that. Anyhow, I got to see a very impressive sunrise for my troubles as you can see in the photo. If you don’t skedaddle off back to your bunk other stuff starts happening that you get dragged into. The next watch came up to a ‘no wind’ situation. It is uncomfortable lying there wallowing in the swell with the sails banging and going nowhere. This started a long debate about what to do. First, I helped define an appropriate weather forecast request which we sent off and received back. The idea was to try to organise our course where we would benefit from the best wind. The plain truth was there was not enough wind to sail but that didn’t stop a couple of futile attempts and a few red herrings about wind and current. About 10.30 we got a tiny bit of wind which would allow us to sail with the wind directly behind us, albeit not precisely in the direction we wanted to go. To do this required putting long poles out each side of the boat and connecting two separate headsails to each side. As long as you keep the boat aligned directly in line with the wind then you can sail and make slow progress in very light winds. It was a problem repeated from the first time we tried it, that there are far too many chiefs and not enough indians when it comes to these jobs. I counted three separate times when I pointed out that something was not quite right and was either overruled or ignored. Not being skipper, and unlike me, I bit my tongue and watched interestedly until someone else spotted the mistake and corrected the overruling party. All very frustrating and wasteful of a lot of time. While all this was going on, an inquisitive turtle popped his head up about 10 yards from the boat to check us out before going on his merry way. We have also had several other visitations from diffent species of dolphins. 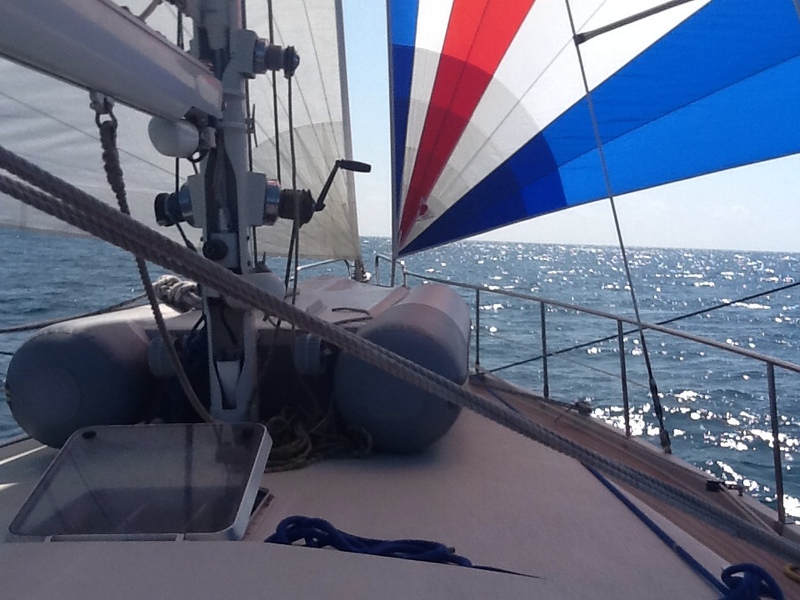 We got there however, and we are now happily bowling along at 6 knots in an 11 knot following wind. The boat looks lovely with the twin sails up but the attached photo can’t do it justice because I can’t get far enough away to get everything into the picture. So just as I am happily about to slink off for a while the generator dies! This is an electric boat with electric winches, lots of sailing instruments, fridge, freezer several computers etc etc. whilst generator failure is not the end of the world, it is an annoyance especially considering that we waited about three days in Panama to have the thing serviced. We think we know what is wrong with it but can’t do any further investigations until the whole thing cools down. We are about 3 degrees north of the Equator and it is approaching a steady 30 degrees day and night. 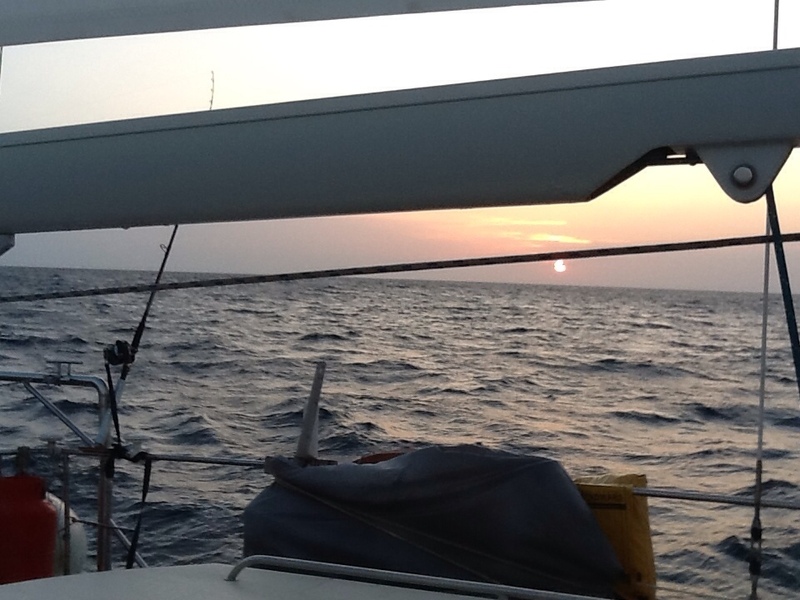 So for now,fixing the generator and finding a way we can sail through the doldrums are the two tasks in hand. I have abandoned fishing because it is a bit complicated to stop the boat with this sail configuration and I don’t fancy trying to drag a tuna, wahoo or marlin in doing 6 knots in the opposite direction to an angry fish.